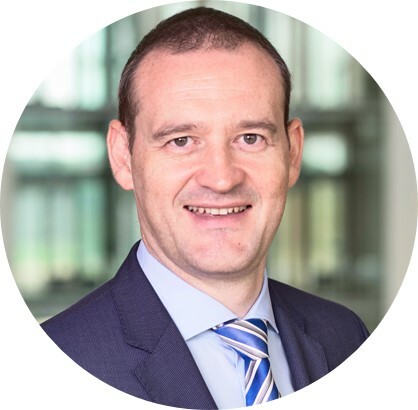 Governance is a priority for the Luxembourg investment fund industry, especially in the current situation, as the country becomes even more attractive with the Brexit aftermath. Governance is more than the observance of the law; it’s about sound decision making and the exercise of good judgement in all areas of the boards’ responsibility. Good governance, ultimately, build trust, key to further develop the country’s investment fund industry. In Luxembourg, management companies (ManCos) are responsible for UCITS* and AIF** funds. Their boards of directors (BOD) are in charge of the investment management, administration and marketing. What are the key areas of ManCo governance? What are the responsibilities of the BOD and which best practices have they implemented in Luxembourg? How can they perform better? In this article, we explore all this and provide a list of recommendations on how to improve the existing governance practices. As the fund industry continues to expand in Luxembourg, the need to be compliant and standout among other European giants is essential. The stable economic environment and expanding financial sector have made Luxembourg an appealing host ManCo’s. 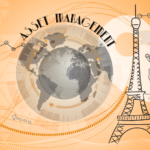 Currently, Luxembourg hosts more than 300 ManCos with a UCITS and/or AIFM licence. According to our 2017 Barometer of the Observatory for Management Companies, they’ve grown exponentially between 2010 and 2017. As this ever-changing and ever-evolving industry continues to grow, there is a growing need to develop ManCos’ core activities and adapt to the trends of the local and global market. In Luxembourg, the authorized scope of activities of a ManCo include portfolio and risk management, fund administration (i.e. legal and accounting services, valuation and pricing of units, regulatory compliance monitoring, etc) and marketing. What are the ingredients for the perfect Governance recipe? Going from the boards’ composition, organisation, roles and responsibilities, among others, these elements are at the base of developing and employing best practices and achieve successful results. Based on our survey on fund governance, we’ve listed below five key areas of ManCo Governance, shortly explaining their importance and impact on the bigger picture. This area relates to the size of the board, the composition and diversity of the roles and responsibilities of its members. In Luxembourg, boards have written terms to appoint independent directors, assigning a permanent chair in line with the best practices. When it comes to choosing a board director, the choice will include a deep analysis of the professional experience, the level of local reputation and if the candidate as enough time to dedicate and commit to performing their functions. What many times do the board members meet over the year and for how long? When it comes to operational matters, it’s essential for a functional board to know the responsibilities’ and tasks of each individual. In Luxembourg, ManCo boards meet between six to ten times a year, depending on the active discussions on existing issues at high level. Sometimes, boards organise small sub-committees to work on specific subjects such as risk, audit, valuation and remuneration. Currently, risk committees are currently more frequent In Luxembourg, but boards are increasingly appointing audit committees. It’s essential to encompasses boards’ management style, the performance evaluation, managing relationships with conducting officers, assessing the efficiency/performance of service providers, etc. In fact, board members tend to possess a broad set of expertise including a mix of the following: investment management, distribution, risk management, compliance, legal, fund administration/operations and finance. In Luxembourg, the CSSF requires, at least, two conducting officers to oversee day-to-day management of the fund. The conducting officer, perform delegated functions that aren’t in contradiction. For example, according to regulation, boards have to appoint different conducting officers for the investment management function and the risk management function. When it comes to service providers, Luxembourg boards hardly use tendering or periodical calls for a bid. They use a combination of due diligence and periodical assessment to ensure an adequate and effective supervision of the functions delegated to them. This has to do with determining how the board manages conflict of interest (CoI). In general, 90% of boards have determined how conflicts should be managed. In Luxembourg, most boards have established systematic reporting mechanisms to oversee identified conflicts. On this regard, independent directors play a key role in policing conflicts of interest between the funds and its investment manager and service providers. They act as watchdogs to protect the interest of shareholders. Regulators are placing greater importance of the code of conduct as a way of ensuring the board plays a role in the supervision of trading practices that are fair to fund investors. 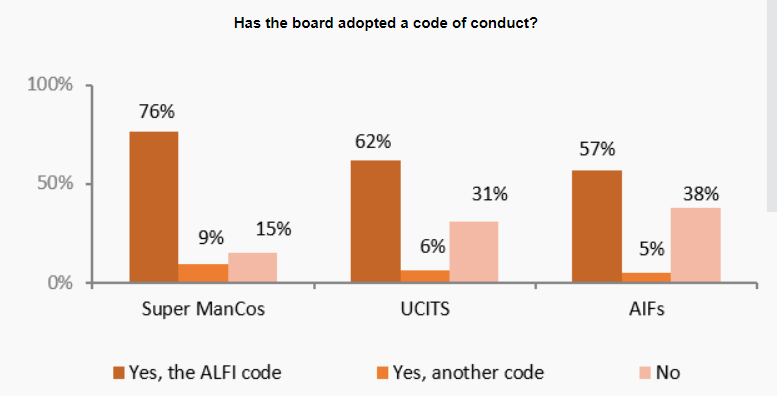 In Luxembourg over 60% of boards have adopted a code of conduct. The BoD governance obligations fall under the ALFI Code of Conduct, a framework of principles and best practice recommendation for the governance of investment funds and management companies in Luxembourg. The key word here is “recommendation”. Even though the Code of Conduct offers visible advantages and a stable regulatory base, in Luxembourg it’s not obligatory. Identify and manage fairly, effectively and to the best of its ability – any actual, potential or apparent CoI and ensure appropriate disclosure. Integrate independent directors. Investors and regulators alike are paying more attention to the practice of retaining independent / non-executive directors are a sign of good governance. Avoid overlapping. Regulators require not be member of both, the board of the management company and the board of the fund, for less overlap and better governance. Define a formal network for the roles and responsibilities of the board members. Implement a programme for ongoing education and orientation. It’s essential for directors to keep up with developments in the industry and follow all regulations and regulations updates. Currently, education is limited. Apart from Anti Money Laundering (AML) training, board members mostly get legal and regulatory updates from promoters. Others topics can be KYC, products and tax. We can retain from the article above that ManCos’ governance is a key factor to contribute to develop the Luxembourg fund industry further. It means more transparency, more documentation of board meetups, more balanced board composition and also sufficient and appropriate governance structure and substance. Additionally, one of the main challenges of ManCos is the control delegated activities and its proper documentation in Luxembourg. The delegation of activities should be based on a clearly documented assessment process and monitored regularly through operational controls and proper due diligence exercise. Pre-order our 2018 edition of our Observatory for Management Companies Barometer here! Previous PostCan Brazilian Pension Funds open new doors to international asset allocation?